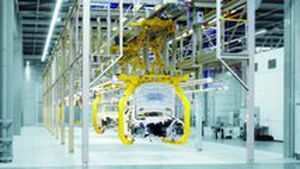 FAStplant® is the response to questions for flexible and easily adapted final assembly. With three basic modules - one simply for conveyor transport, another for the integration of handling equipment and a curved element - complete lines can be formed that can be extended, shortened or relocated just as easily. This is underlined by the fact that a fork lift truck is all that is needed to put the modules in place. A modular overhead conveyor system transports each body through all work processes. Whether for simple assembly tasks requiring utilization of handling equipment, on-hanger chassis alignment or the very complex “marriage, all final assembly processes, from trim to testing, can be implemented with FAStplant®.